1. Preheat the oven to 190ºC, gas mark 5. Tip the fruit with any juices into individual pudding bowls or a 1-litre baking dish. Whisk the orange zest and juice, honey and cinnamon together and pour over the fruit. 2. In a bowl, rub the low-fat spread into the spelt flour to form fine breadcrumbs. Stir in the sugar and muesli and scatter the mixture over the fruit to cover it. Bake for 25–30 minutes, until the top is golden and crisp. 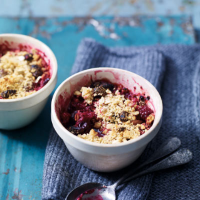 Add some extra crunch to the crumble topping with a handful of chopped nuts such as walnuts or almonds.